Even though we have now had over 50 years to get used to it, there is something so perfect about the shape of the original E-Type Jaguar that its power to stop the world in its tracks has not diminished. With a top speed of almost 150mph and at least as good as any contemporary Aston or Ferrari, it's only because Jaguar sold so many of them that mere mortals like you and I can realistically think of owning one today. The fact that Enzo Ferrari himself declared it "the most beautiful car ever made" just cements the E-Type's position in the motoring Hall of Fame. This particular car is one of the most desirable models of all. An early Series I car with faired-in headlamps, bucket seats and an aluminium dash that could have come straight out of a fighter plane, it is powered by the snarling 265bhp 3.8-litre straight-six that it was designed for – faster and more free-revving than the softer 4.2 that replaced it in late 1964. 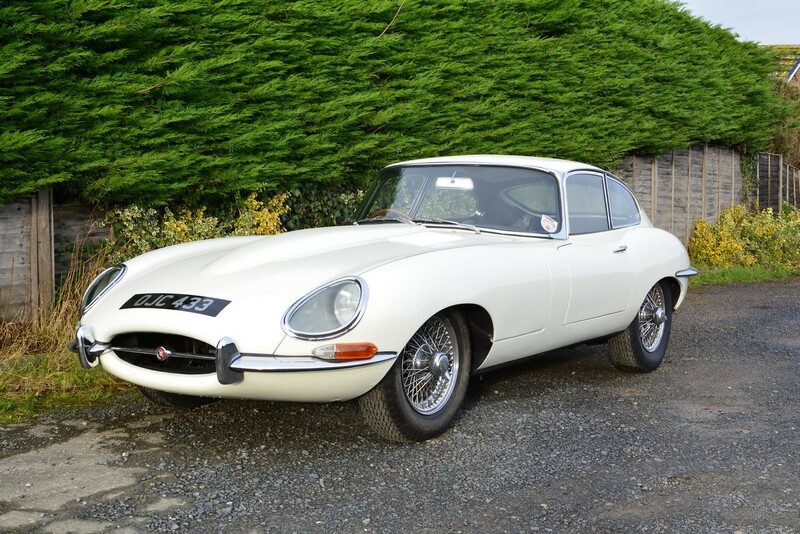 Built in February 1962 and sold through Henleys of Manchester the following month to first owner Roy Oggelsby of Harpenden who was to keep it for 17 years, it is number 230 of only 1,799 3.8-litre Coupes made in right-hand drive. Somewhat indistinct copies of the original and subsequent log books would appear to suggest that the car has had just four private owners in all (although it was also briefly registered to a dealer) and has had one registered keeper since 2011. Presented in Old English White with a black leather interior, bills and photos on file show that the car was treated to a substantial mechanical overhaul in 2000 – 2001 by Thoroughbred Car Services of Southend at a cost of some £12,000. This included renovation of the engine and gearbox; rebuilt carbs; new clutch kit; rebuilt axle; radiator overhaul and fitment of Kenlowe fan; new braking system; steering and suspension overhaul; new engine and gearbox mountings; electrical system overhaul plus numerous other items. The car was subsequently treated to a bare metal respray with all rubbers, seals and trim parts replaced as necessary, while the interior was also retrimmed as required and a stainless steel exhaust fitted. There are no bills for this work but the condition of the car speaks for itself and it presents very well indeed, certainly starting promptly and driving nicely on the occasion of our visit with excellent temperature and oil pressure. Indeed 12 old MOTs show that the car has covered less than 2,000 miles since the renovation 15 years ago (the odometer currently recording an unwarranted 64,400 miles), being mainly kept in Carcoon storage during the current ownership. Although the last MOT expired in November 2013 (with no advisories recorded), the vendor intends to get a new MOT in time for the sale. The original OJC 433 registration number remains on the car and is included in the sale. E-Type values have enjoyed a relentless upwards march in recent years and this thoroughly renovated early car, with the charismatic 3.8-litre engine, bucket seats and aluminium dash, is the purest expression of William Lyons’ original vision before a raft of rules and regulations gradually eroded the initial design intent. Quite apart from being a pleasure to own and drive, one can’t help feeling that it might also prove a canny investment at the guide price suggested. Just take a look at what some dealers are asking for these cars! PS: This car now has an MOT until 9th February 2017 with no advisories recorded.